Icy clouds blot afternoon sun in Catalina for seventh day in a row! How weird is that? Well, on some days, there were Altocumulus clouds, too, helping to blot the sun. Altocumulus clouds are mostly or all liquid clouds, if you care, which I doubt. But then you are here, wasting time on this web site about clouds, so maybe you do care! But, to conitnue the title’s theme, what a remarkable streak here in the “Atacama Desert” of Arizona where it has been said that it has never rained. It certainly hasn’t rained here in recent memory. And, will we have a truly dismal wildflower display? Could be, due to the absence of fall rains that are so important in producing good displays. No rain shows up for southern Arizona for two more weeks in the models. Oh, me. The only thing that will be fun in the next two weeks is looking at the hourly reports for Mount Washington, New Hampshire over the next two weeks, and see how cold and windy it gets. Do you know that once (1989) it was -44°C (-47°F) at Mt. Washington with winds of, oh, I dunno, 100 mph or so? Wind chill probably was around -500°F….. The craziest thing about that long ago ob was that they were reporting “icing”, liquid cloud drops hitting and freezing. But, how could they be liquid at -44°C? Well, its been reported, strangely believe it, as we like to say here, that liquid drops have survived to between -40°F and -50°C by motorcycle-riding, atmospheric scientist, Kenneth Sassen, when he was at the University of Utah. Utah is located north of Arizona. Ken, if I may, thought it was due to sulfur in the droplets associated with volcanic aerosols, so it wasn’t “real” water, but rather the kind of water geoengineers want to inject to cool old mom earth. Maybe, if true, that icing report at Mt. Washington wasn’t “real” water, either, but polluted water from cities and factories to the NW where the wind came from…. BTW, when you get bored some more with our own weather, the obs for KMWN can be found here. You’ll be glad you’re in Arizona when you look at them. Well, you’ll be glad you’re anywhere but THERE! Maybe some geoengineers should spend some time up there instead of proposing crackpotty schemes that would change our sky color. I demand, as persons of the 1960s would, of course, that the people of earth be allowed to vote on such schemes BEFORE they are implemented! 3:36 PM yesterday. 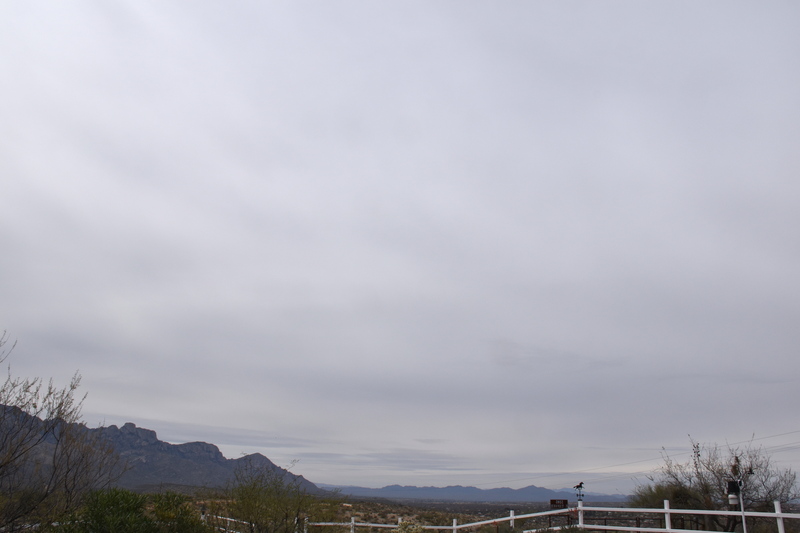 Once again, Altostratus translucidus (too gray to be Cirrus) has blotted the sun. The bottom of this layer was about 20,000 feet above Catalina, according to the balloon sounding yesterday afternoon. 5:36 PM. Sunset was painterly, not bad. The End, for now. Have some other chores to plug away on. This, of course, was a new July rainfall record for Catalina/Sutherland Heights going back to 1977, anyway. Had to adjust vertical axis of this chart, too. Formerly, it stopped at only FOUR inches! The moon lore was right! It’s interesting how the ancient lore of early peoples that I made up a month ago was more accurate than the Climate Prediction Center’s prediction of an equal chance of above or below normal rain in southern Arizona while something incredible was on the doorstep! Kind of like last winter in the whole West where record amounts of snow and rain piled up over a huge region, and that, too, was also unforeseen “going in.” Think how horrible it would be if those predictions were always right. Sure, billions could be saved by such accurate outlooks, but then the element of surprise would be gone. How bad would that be? 9:40 AM. Like most of our summer days, it begins with mid-level layers of Altocumulus, in this case shown here, “translucidus” variety (rather thin, it is.) It was up around 13,000 feet above the ground, if you care. 11:07 AM. As the Altocumulus clouds thinned, burned off, the rise of the Cumulus begins, here a gigantic one spurts upward telling you that there are going to be some blasters yesterday. Very exciting to see this. I can feel your heartbeat as you, too saw it. 11:51 AM. Wasn’t long before giant Cumulonimbus clouds were dumping over there on the town of Oracle. Nice town it is, btw. However, these clouds weren’t much electrified, telling you that the updrafts weren’t particularly strong yet, even though tops here were probably pushing around 30 kft. 11:52 AM. Cumulus congestus, and Cumulonimbus calvus start unloading over there toward I don’t know where exactly, but its just on the other side of the Tortolita Mountains. You’ve probably noticed how clear the sky has been, completely free of haze. That’s good for rain production, since the cleaner conditions are the larger the drops can be in the clouds because there are fewer of them compared to clouds forming on hazy days. Nat King Cole sang about summer haze as early as 1963, so we know that haze is not a new thing, like CO2 is. You won’t find people singing about CO2 in ’63! 11:58 AM. The three amigos…. A slight rain shower can be seen in the slight haze in front of the mountains below the center Cumulus. Tops of these spindily Cu leaned way out again due to weak updrafts and and stronger winds aloft from the S. Since rain forms in the upper portions, it fell a little away from the mountains in these weaker Cumulus. 12:02 PM. Dump truck, fully unloading! Not messing around anymore here. With cloud bases running around 15°C (59°F) there was a ton of water up there. Well, thousands of tons. 12:06 PM. I know what you’re thinking: “Oh, look, a baby dump. Isn’t it cute!” Suggests an abnormally narrow turret poked to far higher altitudes that those around it. 12:24 PM. More Cumulus congestus clouds joined the fray and this became a major 2 inches or more producing system over on the Tortolita Mountains. 1:01 PM. Now the outflow surge can be seen on the left, pushing new Cumulus turrets above it. This was about the peak of it, as it gradually wound down. Its certain that flash flooding occurred with at least 2 inches having fallen in the core. Well, the day closed on a disappointing note as Cumulonimbus debris clouds overspread the sky, killing new convection. 5:45 PM. Altostratus “cumulonimbogenitus.” The day went quietly into the night. Looks like below average rain for August. :(, as we say. Hoping for error here. Average August rainfall here in Catalina/Sutherland Heights is 3.16 inches. 4:17 PM. Line of spreading out Altostratus translucidus. Many of you might have added, “radiatus” to that cloud name. “Clearly” it is widening as it passes over. 4:00 PM AST. That line of ice cloud looks pretty straight doesn’t it? Imagine how wide a cloud would have to spread, after seeing that Altostratus photo, to REALLY be radiating, spreading out! NORTHSTAR AT TAHOE REPORTED 42 INCHES OF NEW SNOWFALL IN THE LAST 24 HOURS. 48 HOUR TOTAL OF 78 INCHES AND A 7 DAY TOTAL OF 122 INCHES1. 1This note passed along to the Arthur by Mark Albright. Looks like a bite has been taken out of the Cal drought this water year, a drought it was said would take years to end! Folsom Lake, near “Sacramenta”, Cal, has risen 30 feet in the past 30 days! Oh, my. 7:19 AM, Jan 10. Pretty Altocumulus, some Cirrus above. Also 7:19 AM, Jan 10th. Time seems to be standing still, as we look a a cloudlet spewing heavy virga. 7:22 AM, Jan 10th, time moving ahead again. Close up of that Altocumulus cloud with virga. Top must have been turreted, colder maybe a half hour or hour before this photo to have so much ice compared to its brethren. That’s the learning part of this sequence. Doesn’t look like an artifact from an aircraft because there is droplet cloud at the top, and not just a clear spot, which usually happens when an aircraft makes ice in a “supercooled” droplet cloud. 5:14 PM, Jan 10th. THought this was a neat scene, Cirrus uncinus, the long trail of ice crystals falling behind, the overhead view. 12:57 PM, Jan 8th. Makes you want to cry… This Cirrus spissatus is trying so HARD to be a precipitator all the way to the ground, and doesn’t know that those bottom ice crystals are evaporating 25,000 feet above it. Totals valid at 11 AM AST, Sunday, Jan. 15th. HECK, this storm wasn’t even predicted 10=12 days ago! The major weather change was indicated about the 20th, plus or minus a day. Those storms, indicated in the NOAA “spaghetti” plots more than 12 days ago, are still in the pipeline after we have a brief “recovery” from the “surprise” storm about to arrive on Saturday! Yay. This sequence of storms is so great for the AZ water situation, too, as well as giving it to Cal good again around the 20th as well. No doubt, as the humans we are, the peoples of Cal will be complaining about TOO MUCH WATER! Published in 1978, but was around in the cloud seeding culture for many years before that. Used without permission. hahaha I believe it was drawn by the founder of Atmospherics, Inc., Tom Henderson’s daughter. Atmospherics, Incorporated performed numerous cloud seeding operations in the US and around the world beginning in the early 1950s. Yours truly worked for them on several occasions in the early 1970s as a “radar meteorologist” directing seeding aircraft. Later, I became a published critic, mostly with Prof. Peter V. Hobbs, of a number of cloud seeding projects. 1Nothing yours truly submitted during the era of BAS as Editor of the J. Appl. Meteor. “got in”, including the benchmark paper reporting that our own aircraft was creating ice in clouds at temperatures as high as -8° C. Three sole-authored papers critical of cloud seeding that I submitted were rejected in 1983 alone! All or parts of them were published years later. The paper on our aircraft, submitted originally in 1981, was rejected twice before being accepted and published in 1983. The effect was confirmed in experiments conducted in the Mono Lakes area in 1991, by the president of Atmospherics, Inc. mentioned above! Aircraft produced ice particles at unexpectedly high temperatures is a now well-known phenomenon that researchers have to be aware of when re-sampling the same cloud with an aircraft at below freezing temperatures. Bernard A. Silverman, publisher of the journal article containing the “Hydro-illogic Cycle” cartoon at the Cape Town, SA, 2006 WMO award ceremony for achievements in weather modification. He acknowledged in that 1978 article that he was a cloud seeding advocate. Altostratus opacus virgae transitions to Altocumulus during day! Storms to bring rain! What a day for cloud maven juniors and me, too, watching the Altostratus opacus (but sometimes “translucidus” cuz you could see where the sun was) become Altocumulus! It happens pretty often and is the result of lowering, and warming of the cloud tops, but I need to generate some excitement on an otherwise somewhat dull day. The TUS balloon sounding through all that Altostratus opacus virgae. Launched at about 3:30 AM. The top temperature is so cold (-60° C, -76° F) we don’t even want to know here in Arizona that such temperatures are possible. So, you can imagine all the ice that might form in a moist layer of air. The bottom is even cold at nearly -15° C, there were the temperature jumps out to the right. This is a situation we call “overrunning”, where warmer air is going over a colder air mass. This cloud was about 22,000 feet thick, 7 km at this point. The slight spread between the two lines illustrates the classic representation of what we measure when the balloon passes through an all ice crystal/snowflake cloud like this version of Altostratus was yesterday morning. The humidity element on the balloon measures the humidity relative to liquid water, not ice, so there will be some spread between the dew point temperature (line on the left) and the temperature (line on the right) when the balloon ascends through an ice cloud. Saturation with respect to ice is indicated here in that deep “overrunning” layer, something also likely to happen tomorrow to the writer’s “company” fubball team tomorrow. And here’s the TUS sounding launched yesterday afternoon when we only had Altocumulus opacus clouds, just as dark as Altostratus opacus, but much thinner. Tops around -10° for the most part, but there may have been some turrets to around -20° C. The balloon almost certainly passed between clouds, did not go exactly through a Altocumulus cloudlet. Don’t worry if you can’t make out the actual temperatures on the lines sloping up to the right, just take my word for everything I say. You can easily see how much it dried out in the middle and upper cloud regions between the morning sounding and this one. 8:29 AM. Altostratus opacus virgae (has some downward pendants of ice and snowflakes coming out of it). The TUS radar had some sprinkles showing up here and there. 8:29 AM. 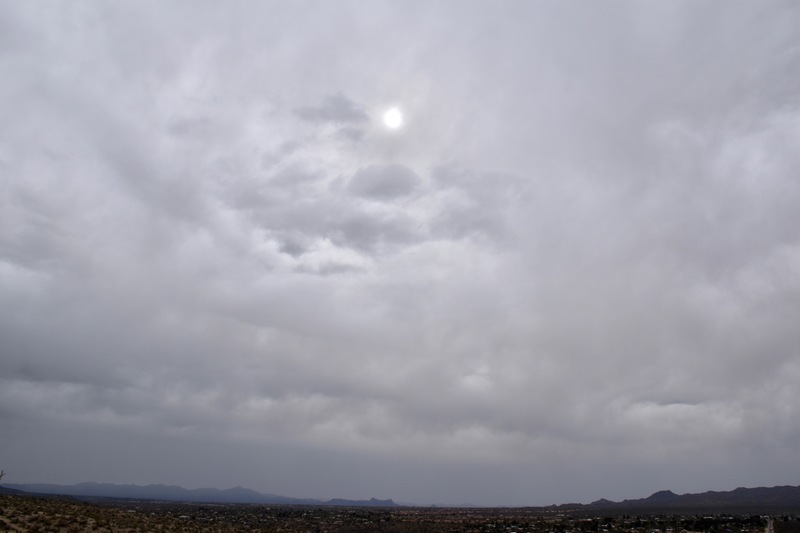 Altostratus opacus virgae (has some downward pendants of ice and snowflakes coming out of it). The TUS radar had some sprinkles showing up here and there. If this seems familiar, the caption is identical with the prior one. Redundancy is one of the niches we practice here, mostly in cloud photos of the same thing. 9:19 AM. 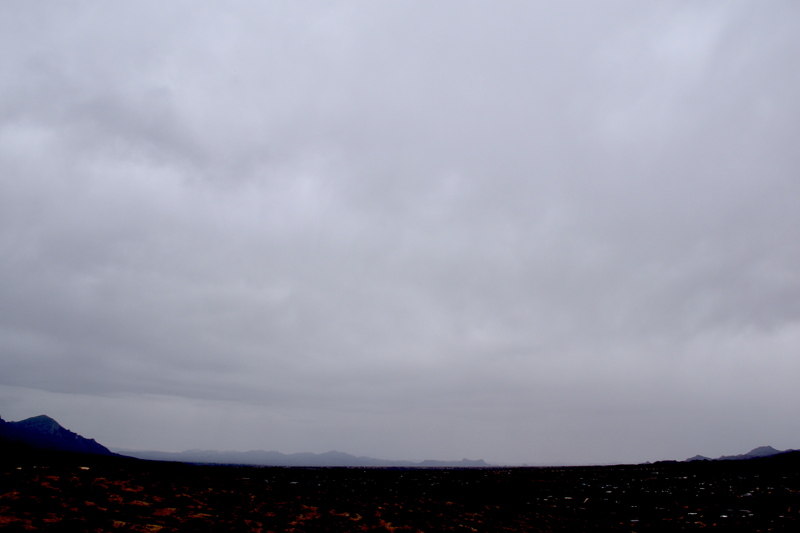 “Thin spots in overcast”: we used to say that a lot in our human weather reports of ages gone by. Here the thin spot makes this Altostratus translucidus.. 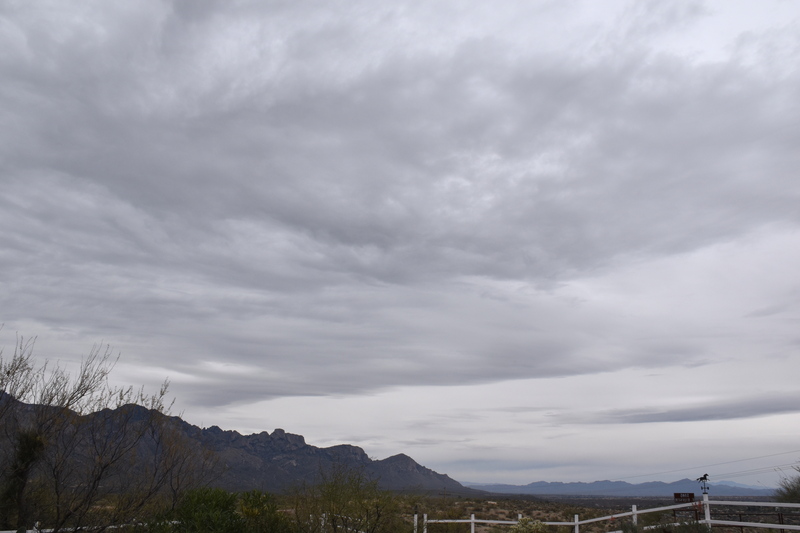 While there is an irregular look to this Altostratus due to virga hanging down, there is no indication of liquid water elements, ones that would show up as sharply-outlined darker elements. While this is hours later than that morning TUS sounding, it is likely that in spite of this thin spot, the Altostratus layer was still many kilometers (thousands of feet thick). Ice crystals and snowflakes are far less numerous than droplets in liquid clouds, and, therefore clouds composed of ice are more transparent given equal depths. Compare the visibility in a dense fog with being in a light snowfall. 9:38 AM. 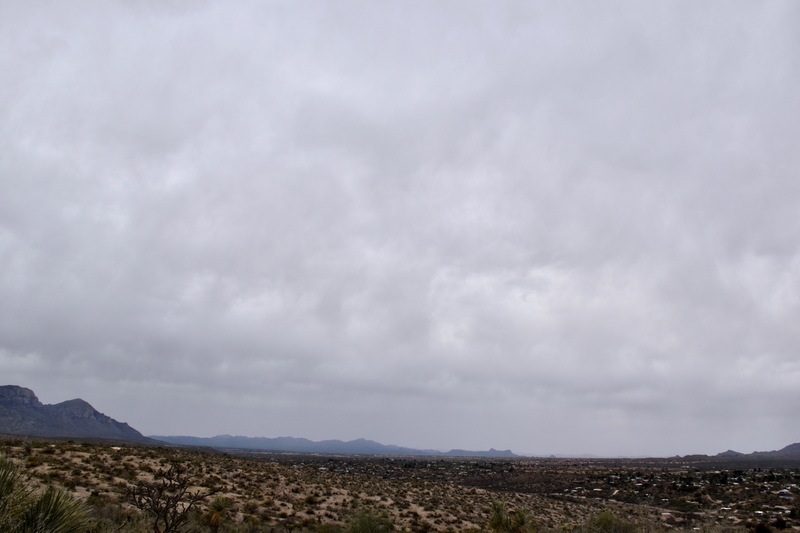 Example of a some sharply-outlined liquid clouds embedded in the Altostratus layer have formed. The growth of ice crystals and snowflakes is enhanced in liquid clouds because they represent regions where it is saturated with respect to WATER, and highly supersaturated with respect to ice (the relative humidity with respect to ice is well over 100%). Also, if the droplets in these clouds are large enough (larger than about 15 microns in diameter) they can be collected by the falling ice and snow, adding to their mass of those, causing them to fall faster. 10:29 AM. Had numerous, dramatic outbreaks of mammatus around this time, probably representing the fall back of turrets on top of the Altostratus as this time. We will say no more about mammatus since the author has tended toward the prurient to break up the tedium in past notations about” mammatus.” This might be viewed as an upside down look at the cloud tops at this point, BEFORE they collapsed and dropped below the main bottom of this layer. 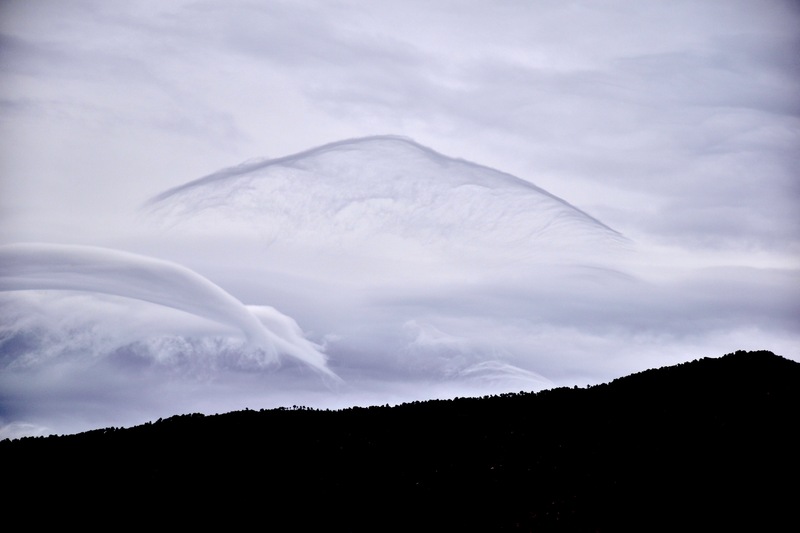 At the top (rumpled area), regions of a liquid cloud layer are beginning to appear, a sure sign that tops are receding. 11:55 AM. 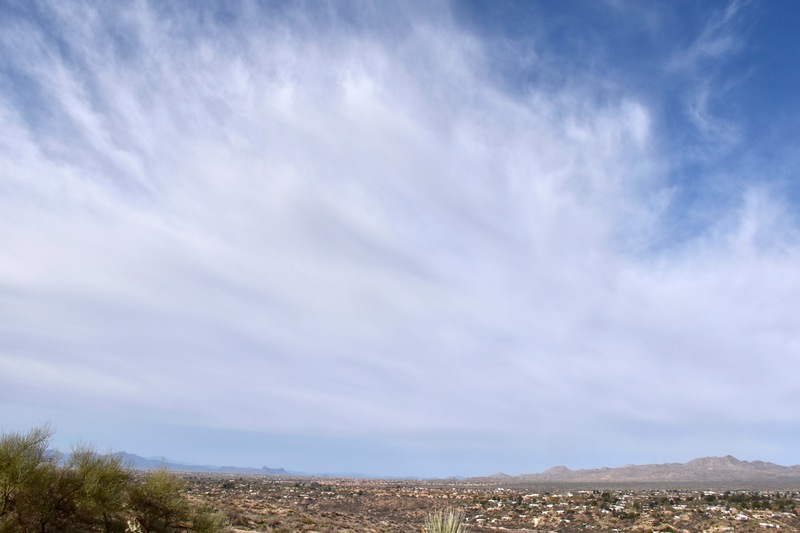 Moving along,looking upwind across the Oro Valley. Still looks composed mostly of ice (Altostratus opacus virgae here), but liquid clouds are on the far horizon. 1:21 PM. Altocumulus opacus rules. The deep icy cloud is all gone by now. No virga. Notice, too, in spite of being less than a kilometer thick, this cloud looks as gray as the Altostratus that was many kilometers thick. 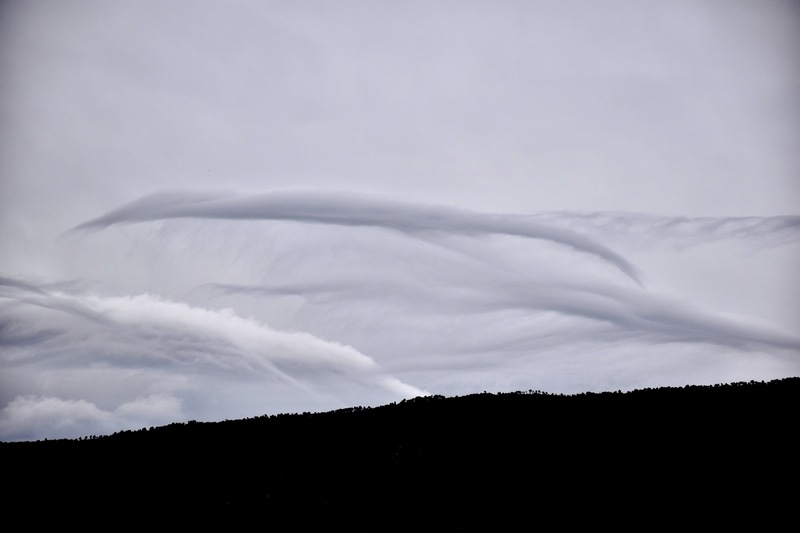 The droplet concentrations in a liquid cloud such as this might be 200, 000 per liter, while the ice concentrations in that Altostratus cloud were likely in the 10s per liter. The smaller particles in Altocumulus clouds, average perhaps only 15-20 microns in diameter also are able to reflect far more sunlight back into space, and less sunlight reaches the bottom making it darker. In contrast, the (ice) particles in the Altostratus would be hundreds of microns to millimeters in diameter (i.e., precip-sized). 2:22 PM. Looking around at these cold Altocumulus clouds, generally not showing virga, you begin to wonder if those areas you do see have been the result of an aircraft passage, as here in that little spot of virga. 2:28 PM. Some breaks in the overcast allowed some nice scenes to fall upon our mountains. Here, the Charouleau Gap is highlighted. From the global ingest of data at 11 PM AST last evening. Indicates that green Catalina will be in the half inch to three quarters of an inch between now and New Year’s Day afternoon. Comes in two segments, the first overnight tonight, and then another starts New Year’s Eve. Seems reasonable. Probably not quite reasonable is the red on the Cat Mountains, indicating 3-4 inches accumulation during this time, probably a bit overdone. Both storms are rather small in size, so the amount of rain depicted in these model runs has varied a lot. But, they seem to be settling on something decent. Seems the least we’ll end up with has to be more than a third of an inch, worst case scenario. See Bob and the NWS for a good look at these incoming events. We’re mostly about clouds here. Undercutting flow from the tropical Pacific is on schedule. So, a good chance for major rains along the southern portions of the West Coast in a few days, with a pretty good chance they’ll leak into Arizony.